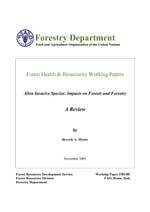 This paper is one of a series of FAO documents on forest-related health and biosecurity issues. The purpose of these papers is to provide early information on on-going activities and programmes, and to stimulate discussion. Further information on forest invasive species can be found at the FAO Alien invasive species Web site (www.fao.org/forestry/aliens) and information on forest health can be found at the FAO Forest health Web site (www.fao.org/forestry/site/pests).